Outlook Group’s innovative MICROLINER® product utilizes a thin release liner technology that produces up to 80% less label liner waste. Just imagine the impact 80% less liner material would have on your high speed labeling lines for a moment. Less materials also means a lower total label cost for you. 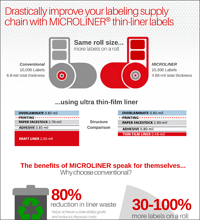 Choosing a sustainable packaging solution has never been easier than Outlook Group’s MICROLINER label solution. Are you interested in exploring pressure sensitive label options further for your brand? Outlook’s experienced team can guide you through the transition from cut and stack to PS labeling. Enter your specific information below and see the cost comparison for yourself. View the infographic to find out.